Although the ability to evaluate MRI studies is critical to the delivery of effective spine care, most spine specialists learn this skill in an informal fashion during training and in clinical practice. As a result, we may not have an understanding of the science and physics behind MR imaging and the various pulse sequences that are available for obtaining the scans. Many of us prefer to read our patients’ MR imaging studies ourselves rather than rely solely on the “official” radiologist’s report. We learn to make preoperative, intraoperative, and postoperative decisions based on those readings. However, unlike radiologists who are trained to evaluate MRI studies in a systematic fashion, we may be more likely to evaluate the images in a less organized manner and to rely on our anatomic expertise and experience, which may not be the most effective method. 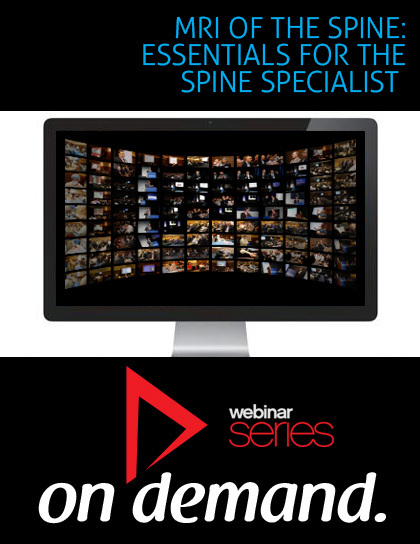 This online course teaches spine specialists how to systematically evaluate and interpret MR imaging studies of the spine. Although there are many courses that focus on MR imaging of the spine, this one is distinctive in that it is given by spine surgeons and radiologists specifically for spine specialists. As such, it is more clinically oriented than other courses. It also provides an excellent reference for radiologists and others such as physical medicine and rehabilitation clinicians, rheumatology physicians, and nonoperative musculoskeletal care specialists who evaluate MR images of the spine and who would like to gain a better appreciation of the associated clinical aspects. Released on March 21, 2016 and available for purchase until March 20, 2019. You can view this product indefinitely after the purchase expiration date through your My Account. Spine specialists who want to learn how to evaluate and interpret MR imaging studies of the spine, including radiologists, physical medicine and rehabilitation clinicians, rheumatology physicians, and nonoperative musculoskeletal care specialists who evaluate MR images of the spine and who would like to gain a better appreciation of the associated clinical aspect. Khanna, A. Jay: Royalties: Thieme Medical Publishers (B); Private Investments: New Era Orthopaedics (15%), Cortical Concepts (16%), Boss Medical (9%); Consulting: Orthofix Spine (D); Speaking and/or Teaching Arrangements: AOSpine North America (B); Trips/Travel: AOSpine North America (A); Scientific Advisory Board: Orthofix Spine (B); Other Office: Johns Hopkins Center for Bioengineering, Innovation and Design (Advisory Board, Paid directly to institution/employer); Grants: Siemens Healthcare (B, Paid directly to institution/employer). Carrino, John A.: Consulting: Abbott (B), Medtronic (A), Best Doctors (A); Scientific Advisory Board: Siemens Medical Systems - Syngo (Travel reimbursement), Carestream Healthcare (Travel reimbursement), GE Pain Management (Travel reimbursement), Merge Healthcare (Stocks); Research Support - Investigator Salary: Carestream (B, Paid directly to institution/employer), MedImmune (B, Paid directly to institution/employer); Grants: Siemens Medical Systems (E, Paid directly to institution/employer), Integra (D, Paid directly to institution/employer), Toshiba Medical Systems (D, Paid directly to institution/employer). Sciubba, Daniel M.: Consulting: NuVasive (C, Paid directly to institution/employer); Speaking and/or Teaching Arrangements: Medtronic (C), DePuy (C), Globus (C). Araghi, Ali: Royalties: Alphatec spine (A); Stock Ownership: Magellan (<1%); Private Investments: PDP (<1%), AMS (<1%), Bonovo (<1%), Pioneer (<1%), K2m (<1%), SurgiFile (<1%), Oroboros (<1%), Disc Motion Technologies (<1%); Consulting: Pioneer (None), Alphatec Spine (B), Integra Spine (B); Speaking and/or teaching arrangements: Integra Spine (None); Board of Directors: American Board of Spine Surgery (None); Scientific Advisory Board: Magellan (None), Transcorp (2%), Trinity Ortho (None); Research Support (Investigator Salary): Anulex (B), Stryker (B), LDR (None). Cheng, David S.: Nothing to Disclose. Choma, Theodore J.: Stock Ownership: Gentis (1%); Consulting: Stryker Spine (B); Scientific Advisory Board: Gentis (B); Research Support (Staff/Materials): Stryker Spine (C); Grants: DePuy Spine (D). Daubs, Michael D.: Royalties: Synthes Spine (F); Consulting: DePuy Synthes Spine (B); Board of Directors: AOSpine North America (B); Grants: Stryker Spine (C, Paid directly to institution/employer); Fellowship Support: AOSpine North America (D, Paid directly to institution/employer). Dekutoski, Mark B.: Royalties: Mayo Office of IP/Medtronic (E, Paid directly to institution/employer); Consulting: Mayo Medical Ventures/Medtronic (B, Paid directly to institution/employer); Speaking and/or teaching arrangements: Mayo Medical Ventures/Medtronic (B); Scientific Advisory Board: Broadwater Associates (B, Paid directly to institution/employer); Fellowship Support: AO Foundation (E, Paid directly to institution/employer). Dohring, Edward J.: Royalties: Stryker (D, Paid directly to institution/employer); Research Support (Staff/Materials): Medtronic (B, Paid directly to institution/employer). Fish, David E.: Grants: Medtronic (C, Paid directly to institution/employer); Fellowship Support: Boston Scientific (C, Paid directly to institution/employer). Hsieh, Patrick C.: Consulting: DePuy Spine (C), Medtronic (C); Speaking and/or teaching arrangements: Medtronic Sofamor Danek (C); Research Support (Staff/Materials): DePuy Spine (C, Paid directly to institution/employer). Khanna, A. Jay: Royalties: Thieme Medical Publishers (B); Private Investments: New Era Orthopaedics (15%), Cortical Concepts (16%), Boss Medical (9%); Consulting: Orthofix Spine (D); Speaking and/or teaching arrangements: AOSpine North America (B); Trips/Travel: AOSpine North America (B); Scientific Advisory Board: Orthofix Spine (B); Other Office: Johns Hopkins Center for Bioengineering, Innovation and Design (Advisory Board, Paid directly to institution/employer); Grants: Siemens Healthcare (B, Paid directly to institution/employer). Lehman, Ronald A.: Grants: DARPA (G, Paid directly to institution/employer), Centinel Spine (E, Paid directly to institution/employer), DePuy Synthes Spine (C, Paid directly to institution/employer), DMRDP (I, Paid directly to institution/employer). Lenke, Lawrence G.: Royalties: Medtronic (I); Board of Directors: Scoliosis Research Society (Travel expenses); Research Support (Staff/Materials): DePuy (B, Paid directly to institution/employer). Moen, Erik Paul: Consulting: Retul (Advisor/consultant, link on website); Speaking and/or teaching arrangements: BikePT (Owner/founder/instructor, B, Paid directly to institution/employer); Other Office: American Physical Therapy Association (B, Paid directly to institution/employer). Mroz, Thomas E.: Stock Ownership: PearlDiver (10,000 shares); Consulting: Globus Medical (B); Speaking and/or teaching arrangements: AOSpine (B); Board of Directors: AOSpine North America (None), North American Spine Society (Education Council Director). Park, Paul: Consulting: Globus Medical (B), Medtronic (B); Speaking and/or teaching arrangements: Globus Medical (C); Scientific Advisory Board: Neuralstem (B); Grants: NIH (B, Paid directly to institution/employer), SMISS (B, Paid directly to institution/employer); Relationships Outside the One Year Requirement: DePuy (Dissolved 8/2011, Speaking and/or Teaching Arrangement, B). Rao, Raj D.: Board of Directors: North American Spine Society (CME Committee Chair), Lumbar Spine Research Society (None); Other Office: American Academy of Orthopaedic Surgeons (Chairman, Diversity Advisory Board, Travel expenses), Medicare Evidence Development and Coverage Advisory Commission (Voting Member of US Centers for Medicare and Medicaid Services); Grants: United States Department of Defense – Navy (G, Paid directly to institution/employer), United States Department of Defense – Army Medical Research Acquisition (F, Paid directly to institution/employer), National Highway Traffic Safety Administration (F, Paid directly to institution/employer), U.S. Department of Education, National Institute on Disability and Rehabilitation Research (G, Paid directly to institution/employer); Other: The Spine Journal (None), Editorial Board of JBJS Reviews (None), Seminars in Spine Surgery (A). Rittenberg, Joshua D.: Nothing to Disclose. Schoenfeld, Andrew J.: Scientific Advisory Board: The Spine Journal (None); Research Support (Staff/Materials): Robert Wood Johnson Foundation (C, Paid directly to institution/employer); Other: American Academy of Orthopaedic Surgeons (Adult Spine Evaluation Committee). Sengupta, Dilip K.: Royalties: Globus Medical (D); Stock Ownership: Globus Medical (<1%); Consulting: Globus Medical (None); Scientific Advisory Board: Globus Medical (Travel expenses); Research Support (Staff/Materials): Globus Medical (D, Paid directly to institution/employer); Fellowship Support: Globus Medical (B, Paid directly to institution/employer); Other: Globus Medical (Amount not disclosed, Paid directly to institution/employer). Smith, Jeremy S.: Consulting: Spineart (B). Villavicencio, Alan: Stock Ownership: Lanx (2%, Founder); Board of Directors: Justin Parker Neurological Institute (None); Other Office: Boulder Neurosurgical Associates (Managing partner); Research Support (Investigator Salary): ProFibrix, Medtronic, (F, Paid directly to institution/employer). Whitcomb, Gregory L.: Nothing to Disclose. Disclosures current as of March 20, 2014.